The Brecon Beacons National Park offers spectacular views over the glacial valleys and provides a haven for wildlife and hikers alike. On clear days is it possible to see as far as the coast of Devon, Herefordshire and Pumlumon from the summits. The geology of the Brecon Beacons is protected as a 5009.95 hectare Site of Special Scientific Interest (SSSI). Within this there are Special Conservation Areas (SAC), which includes the summits of Pen y Fan, Cribyn and Fan y Big. The Brecon Beacons are reportedly named after the practice of lighting signal fires to warn of oncoming attacks by the English into Wales. Nearly four percent of the National Park, some 5,000 hectares, is cared for by the National Trust. This includes Pen y Fan (�Top of the beacon�), the highest hill in southern Britain at 885 meters above sea level and as such it is a tourist "honey-pot�. 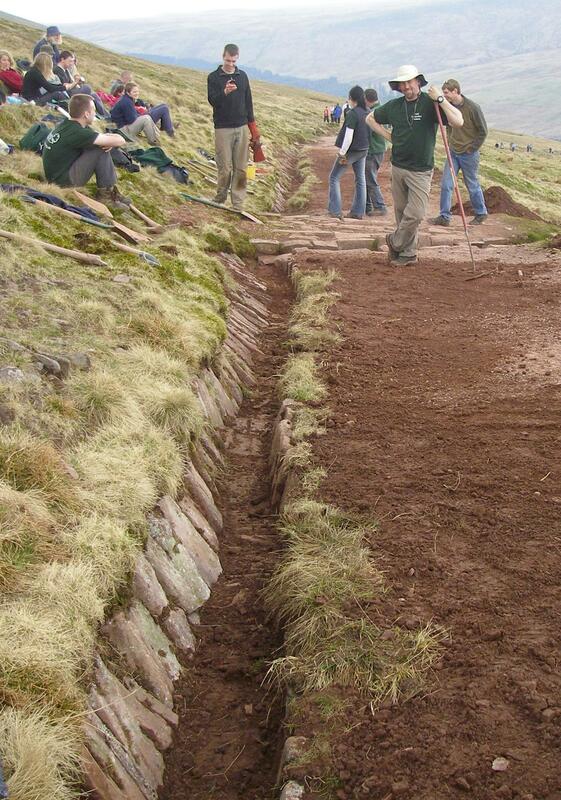 OCV have worked with the National Trust on and around Pen y Fan doing vital work such as trail maintenance, drainage culverts, building revetment walls and stone pitching drains. The Brecon Beacons (Bannau Brycheiniog in Welsh) are a chain of peaks that form a horseshoe around the head of the Taf Fechan river to the South-East. The lower slopes of Pen y Fan are on Senni Beds Formation mudstones and sandstones, while the upper slopes are of the Brownstones Formation and the peak is of the Plateau Beds Formation sandstone. The red sandstones were laid down during the Devonian period (416 to 359 million years ago). The current landscape owes a lot to the glaciers from the last ice age, leaving behind the sharp peaks and great glacial valleys. The summit of Pen y Fan still bears ripple marks left by the seas. Approximately half of the Brecon Beacons consists of dry grassland. There are also important areas of heath and scrub. Heathers and the reed juncus are commonly seen on the slopes. The Old Red Sandstone cliffs of the Brecon Beacons, such as those of Pen y Fan, are reported to support the most southerly representation of Calcareous rocky slopes with artic-alpine flora and fauna in the UK. Among the species at the site are purple saxifrage, brittle bladder-fern, green spleenwort and several rare hieracium. Nationally scarce bryophyte species recorded here include plagiopus oederianus and scapania aequiloba. Where calcareous sediments have been leached from the rock species such as serrated wintergrass and fir clubmoss can be found. Bryophytes that thrive in these lower cliff faces include the rare brachydontium trichodes and rhabdoweisia crenulata. Pen y Fan also supports small areas of dry heathland, which provides habitat for species such as heather and bilberry. On lower slope where grazing of the thin acid grassland is higher, heathland species are more sparse. Bracken can be found growing in deeper soils at lower down the hills, alongside mixed scrub. The cliffs in the Brecon Beacons, such as those of Pen y Fan are known to provide nesting sites for birds such as peregrine falcons and ravens. The primary function of the Brecon Beacons National Park is to conserve and protect its diverse and stunning habitat, wildlife and landscape. OCV have helped the National Trust to maintain and resurface many trails around the glaciated slopes within the park, such as those on and around Pen y Fan, to encourage the large number of visitors to stick to the paths and minimise their impact on the habitats. Trail maintenance has significant environmental benefits because it greatly reduces erosion of the upland slopes and protects the delicate wild flora and fauna. Important repairs have been done by OCV on drainage culverts and ditches, clearing debris, soil and juncus from the drainage routes and digging/extending ditches to direct water away from the paths. OCV have also built revetment walls and stone pitched drains in the area in order to channel the water off the mountains to reduce the erosion from water running down the slopes. We have also assisted seeding and landscaping the thin soil as part of vital upland erosion control. When working at Pen y Fan we stay at the National Trust base camp Dan y Gyrn. To reach the base camp, travel South-West along the A470 through the village of Libanus. A few yards after the A4215 junction for Defynogg on the right, take a left down a narrow lane. If travelling from the South, you will see the turning to the A4215 junction for Defynogg on your left and the road to the basecamp just before it on the right. Note that this is the second turn on your right after you see the junction for Defynogg on the left. When the lane turns sharply left carry straight on. Pass a campsite on the right and as the road rises turn into a farm yard on the right. This is the National Trust base camp.